I promised in my post earlier this week when I wrote about a Girls Nite In event that I hosted that I would post the recipe for the Meatloaf sliders that I served and I’m nothing if not a woman of my word! Except that really it’s ‘just’ a recipe for meatloaf. Seriously the best meatloaf sure but you can serve it the old fashioned way; you know, as a Sunday dinner type of thing. And I usually do. But then, much like I look forward to this turkey sandwich far more than the actual turkey, I also can not wait til the next day (or the next snack maybe?) to make some sliders and these are simply the best! Are the pretzel rolls a necessity? No. But they sure are good! I’ve been experimenting with blending different ground meats for meatballs and thought I would do the same here. Maybe you do that already and while I think I’m being so innovative I’m actually late to the table? Still, I’ve seen recipes to add ground chicken or turkey or pork but never ground sausage…and why not? It’s not only ground but it’s been seasoned and that’s been the extra oomph that has made these dishes so special. I truly can’t take much credit; as a matter of fact I could write a cookbook called; ‘From Whatever You Have in Your Pantry’ as that is the story of my life. I try to keep a fair amount of food in my pantry and fridge and pretty much refuse to go shopping for one item; so it’s a question of opening a door and saying to myself, ‘Whatcha got?’ This time around I hit the jackpot. I had my last cache of meat from 5280 Beef (sob) which consisted of some bacon, ground beef and breakfast sausage…and meatloaf seemed the perfect thing to pull them together. Remember Emeril Lagasse; the original Food Network Star? I’ve used a recipe of his for years but I’ve also kicked it up so many notches I’m not sure where his begins and mine ends anymore but let’s just say it was good to begin with and my changes over the years have not hurt one tiny bit! If I recall he poured a tomato like sauce on top of the meatloaf but I’ve always loved a glaze I made with the first meatloaf I ever made so it’s a given and had to be. 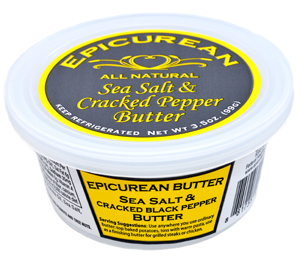 Another thing I’ve done differently is to use Epicurean Butter for sauteing the vegetables instead of just plain butter. I love how a small amount of this butter can elevate so many of my dishes. I was provided with an assortment of butters to sample and would be hard pressed to name a favorite. I love the Roasted Garlic as a quick addition to pasta and veggies for a weeknight meal and I may have indulged a bit too much when I tried both the Maple and Caramel Sea Salt Butter on biscuits one day. All natural is a plus but I can’t deny I love that they are made in Colorado. Still…I’m happy to share! Take at look at their website for locations and pick up a couple; they are so versatile and if you’re like me you’ll always want to have a couple on hand! I kept it simple with this meatloaf because I was adding so many flavors and used the Sea Salt and Cracked Pepper Butter…great on biscuits too! Time to get your hands messy! Really no better way to mix a meatloaf than with your hands; whatever you do don’t use a mixer; it should be well mixed but not like a batter, just everything incorporated well together. I’m hungry again! The meatloaf itself is fantastic, the bacon on top adds a great flavor and then there is that sauce. Altogether a really fantastic meal. Still, for me, the star is my absolute favorite meatloaf sandwich. And don’t you dare go putting that meat in the microwave; it’s meant to be cold. And yummy. Wish I had more leftovers. I would have one for breakfast RIGHT NOW! It was just perfect with the fresh tomato salad I posted the other day along with some great ready to drink cocktails; be sure to visit that post if you missed it for some delicious treats I made for a Girls Nite In party! The BEST Meatloaf is Perfect for Sliders! In a large skillet heat the butter over medium-high heat; add the chopped onions and celery seed and cook, stirring occasionally, until vegetables are softened and beginning to caramelize around the edges, about 6 minutes. Add the garlic, thyme, rosemary, and parsley and cook for 2 minutes. Remove from the heat, put into a large bowl and allow to cool. When the vegetable mixture is cooled add the Parmesan, eggs, mustard, ketchup, Worcestershire sauce and heavy cream and mix until thoroughly combined. Add the breadcrumbs, ground chuck, pork sausage, salt and pepper and mix until just combined. Do not overmix. Transfer meat mixture to a large baking pan and using your hands, form mixture into a loaf shape. Arrange the slices of bacon on the top of the meatloaf and bake for 45-50 minutes or until the bacon looks cooked. Combine the Chili Sauce, brown sugar and whole grain mustard and slather it over the bacon; return to the oven and bake for 10 more minutes. Remove from the oven and cover loosely with aluminum foil. Let stand for 10 minutes before serving. 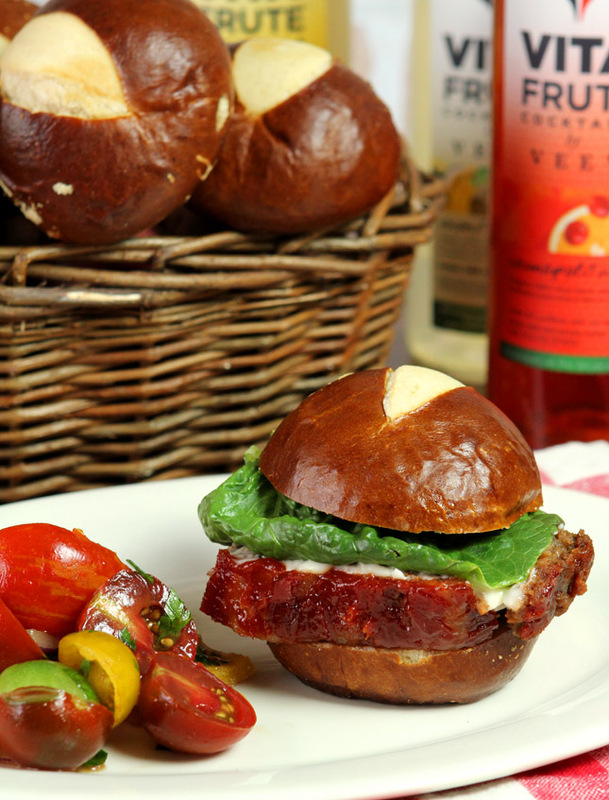 For Sliders; simply cut chilled meatloaf and serve on rolls with lettuce and mayonnaise. I was provided with samples for this post however all commentary is my own. Yes Janice… you really do need to do that! Now that’s a meatloaf recipe. With fall around the corner, meatloaf will become a regular on our table. I’m always on the hunt for new recipes and this one looks like a winner. Great post, Barbara! Those sliders look fantastic ! Similar to my recipe, but with a few differences. Love meatloaf sandwiches. It’s weird because I like both of them, but I’ve never made meatloaf! And I rarely make meatballs. Although when I do, I use at least two different kinds of meats (usually beef and pork, sometimes veal or turkey; almost never sausage, although I’ve done that). I do order meatloaf in restaurants from time to time, but just never make it at home. Gotta change that, and your recipe looks like a great place to start! I love adding sausage to my stuffed bell peppers which have now become a Halloween tradition. This looks totally delish. A bacon drape makes everything taste better. My mother turned me off once and for all to meatloaf. Hers was flavorless and dry. But wow does yours flip meatloaf on its head! The herbs and spices, the flavorings and the sausage and bacon I’d be happy with a serving or two of your meatloaf! Fabulous! My mom always ate cold meatloaf sandwiches the next day. With one or two of your sliders I’d finally do it myself. That sausage meat is an inspired addition, Barb. Bet the added fat keeps it from being at all dry, as well as adding fabulous flavor!